Vero, a photo-sharing app that launched in 2015, is the latest app to benefit from ongoing frustration with Facebook and Instagram's hated algorithm not to mention recent uselessness of Twitter . A week ago, Vero was ranked so low it didn't even appear in the App Store's top 1,00 apps; today it's the most popular app both on the App Store and Google Play Store. It's gotten so popular that the app's servers have been overloaded, with many users unable to post or even sign up for an account. The creators and owner of the app are very clear and upfront it will be a pay as you go app. I like the idea and I never believed in freebies and if is free is too good to be true. I like as well the concept no algorithms no advertising. In exchange of a fee?? Why not! 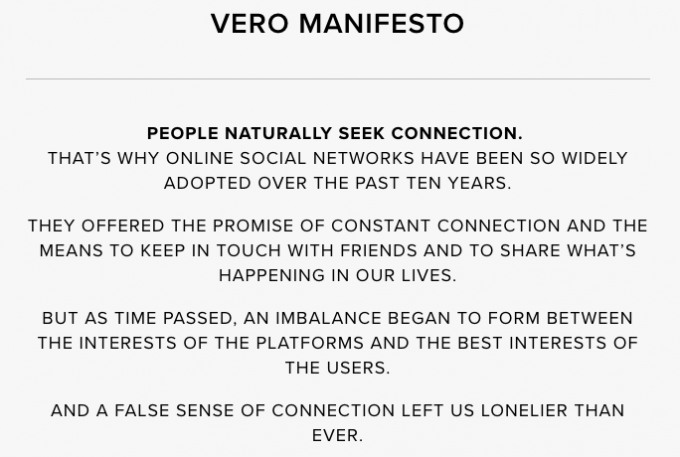 Here is a summary of the manifesto: Vero is unhappy with the way social media has become about algorithms and ads, and they’re trying to create a more “natural” way of sharing things. In practice, that means no ads, ever (the service will be funded in part by an annual subscription model they’ll introduce soon, and in part by Vero receiving a commission on sales made through the platform). It also means users have more control over who sees their posts: the news feed is chronological rather than thrown together by an algorithm, and users decide whether each post they make will be broadcast to close friends only, friends only, friends and acquaintances, or anyone who chooses to follow them. In its manifesto, Vero said it does not incorporate advertising into its revenue model, but will instead begin charging users for a subscription after 1 million free users have joined the service. It’s similar to Facebook in that you can have friends as well as followers, divided into acquaintances, friends and close friends. You can use it to chat with people, and you can post a range of content like links, text posts, photos, film recommendations etc. It’s similar to Instagram in that you can post nice looking photos. There are no stories, it is good for me...I never used them anyway. Arguably, its biggest selling point is that it has a chronological feed, allowing users to see everything. Companies can’t pay to boost posts because there is no algorithm that highlights certain posts over others, meaning – provided you scroll far enough down – you won’t miss any of your friends’ images. Another interesting feature is the fact that, unlike Instagram, users aren’t required to crop their images: full-sized photos can be uploaded and displayed in their original ratio. I like very much the modern design the easiness in creating an account and in how to use it. Like most social media apps, you first have to sign up with your phone number and email address after you get Vero. By entering your phone number, you can let Vero access your contacts to see which friends are also on the app. You can also invite your contacts to make a Vero account. This step is also skippable, and you can connect with friends later. Once you’re all signed up, you officially have a Vero account. Now you can add a bio and avatar to your profile page. Vero will then show you its “Featured Content” page. Similar to Instagram’s Explore page, it’s where you can check out posts from verified Vero users. When you tap “Done” in the upper right-hand corner, you’re brought to the main page — your Vero feed. The app will then direct you to share your first post. Here is where the world opens up. You can post a myriad of different things to your Vero feed. Search for music (they literally have it all), movies (seriously, they have every movie ever), books (yeah, all the books), places, links, and finally photos and videos. Still kind of afraid of the great beyond, we decided to keep things simple with a photo post. The Vero photo editing process is almost identical to Instagram’s. Your filters and simple editing tools are cleanly displayed below your photo. You’ll still be able to pre-edit in another app and then upload from your library, too, if you like to have a bit more variety in your editing options. Tap “Done,” add a caption, tag a location if you like, and then choose who’s able to see your post. When adding friends and followers in Vero, you’re able to categorize them into “close friends,” “friends,” and “acquaintances,” thus letting you control how far you want each post to reach.